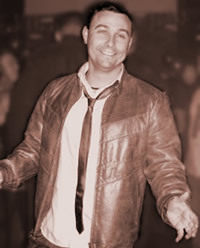 I'm the founder of DataMouse.biz, a database developer, iconist and general all-round web monkey. “How’d you get here?”, I hear you ask. Well, it all started many moons ago when I was working for a very large delivery company in the UK. Back then, I used to be supplied with all kinds of Excel information about the call centre’s performance, employee impacts and various other boring operational stuff. Sometimes, the figures didn’t seem to add up and our management information team couldn’t explain the anomalies to my satisfaction – so I decided to learn how to check them myself. First, I started out with Microsoft Excel, and I found that I had a natural aptitude for it. This was followed by Microsoft Access, and I quickly learned how to create basic databases that could help me in my normal day job far faster than our support areas could. Within a few months, I had colleagues asking for favours: “Can you just knock me up a report, Danny?” I didn’t mind; I was constantly learning and quite enjoyed being the “go to guy” – even if it was for being a nerd. Away from work, a friend of mine ask me to build him a database that would track his customer orders for his new furniture removals business. It took a lot of trial and error, and loads of support from the guys at Experts-Exchange.com and other forums before I could deliver the final project. Looking back on it, the system was not great. But, it was far better than a standard MS template and did everything that my friend needed. A few months later, another friend asked for a database. This one was to be used by 3 people at the same time – my first multi-user system – and it also had to look nice. I created some simple icons for the buttons and delivered a great system that looked far more professional than the standard Access 2000 dull grey format. “Wow!”, he said. “These graphics are great! Can you make websites too?” I couldn’t, but thought I’d give it a go. A few books later and I’d created a very simple HTML website. It was very basic. It was dull. But it worked and I really enjoyed the challenge of learning another language. After the first attempt, I was hooked. I practiced. I read. I practiced more. After creating around 20 websites for friends and co-workers, I decided that I would offer my services professionally on the internet – and DataMouse.biz was born! That was back in late 2006, and I’ve created over 200 websites, databases, icon sets, banners, spreadsheets and loads more! 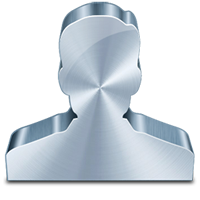 Take a look around the site and feel free to drop me a line with any suggestions using the contact form at the top right of every page. 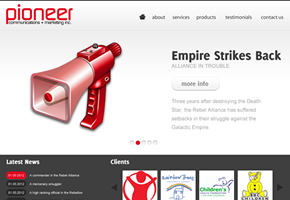 A fresh-styled static HTML and jQuery-powered site for a communications and marketing company. 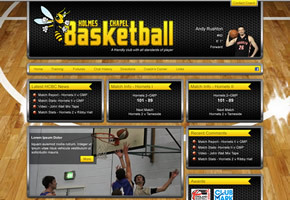 Highly customised Wordpress-based web site for a local basketball team, the Holmes Chapel Hornets.